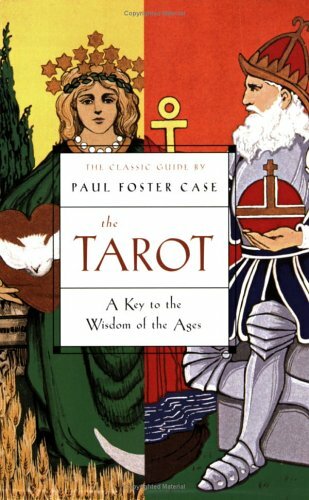 I've been researching Paul Foster Case's tarot system for a couple of years now. One of the more interesting aspects of his work has to do with his incorporation of musical tones into the framework of the cards. Here is the foundation that I created for my personal meditations. 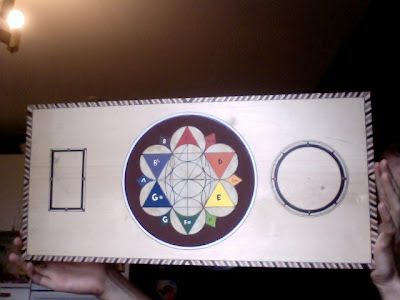 Only took a few days to create this puppy with a 2ft x 1 ft x 3/4 inch wooden board, a compass and ruler, a sharpee, acrylic paints, rubber cement, colored pens, and some vision. This is what the board looks like with a few of the pieces. 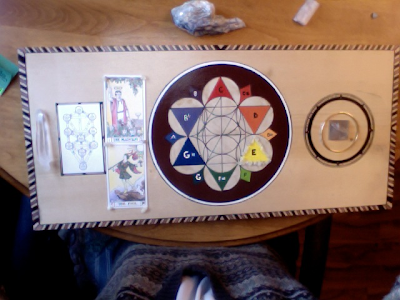 Today I added a lemurian seed (quartz crystal) on the furthermost left side of the board. In the tarot throne I've positioned a card-sized map of the Tree of Life. The two cards on the right-hand side of the tree of life are the Magician and Fool card, anchored by six small pieces of copal. I chose these cards because they are associated with E-YELLOW in the B.O.T.A. system. I have ornamented the outer rim of the YELOW-E triangle because that is the tone color that I have been focusing on. These are also simply copal bits layed out in a row. On the right hand side, in the 88-dotted compass, sits a quartz crystal pyramid within a copper band. At the top of the image, off of the board, is a pointer - the bulk of it is a quartz crystal infused with kyanite and small bits of red gypsum. It fits nicely in the palm of my hand, with an extended pointer which I sometimes rest my finger on. The mineral comes in handy during the beginning of the meditation, to get grounded and to gather etheric energy. Once I have gathered enough energy, I direct the pointer toward the central mandala and begin to charge the image through clockwise and counterclockwise spiral movements toward and away from the Center. 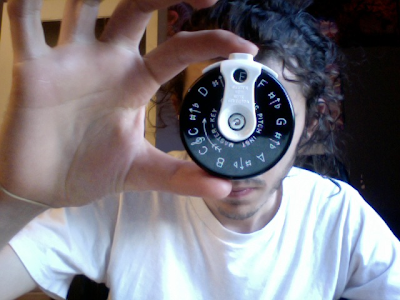 This is a pitch pipe. I keep it in my left hand while I'm collecting energy with the kyanite pistol. As you can see, the pitch orientation is E natural, just like the highlighted triangle on the board (E-YELLOW). Once the board is charged up and energy is beginning to move, I raise the pitch pipe to my mouth and take a deep inhalation. My right hand is holding the kyanite and it moves toward the apex of the appropriate tone color (e-yellow). As I exhale into the pipe, the E-Note gently fills the room and I begin a series of movements around the perimeter of the triangle, followed by another few cycles around the circumference of the sphere that encompasses the triangle. Standard has been 3 counter-clockwise movements around the triangle and 7 counterclockwise movements around the sphere. On the upswing from the final rotation around the sphere, I gently swing the spiral to the right, making an S-Curve which wraps around the top of the copper bracelet and fluidly enter into a clockwise rotation around the perimeter of the circle. Usually seven rotations around the copper coil, spiraling toward the central apex of the crystal pyramid, and then lightly tapping the tip of the pyramid's aura (about 1 inch above the physical tip). At this point I finish blowing into the pitch pipe, and holding the pipe in my left hand, bring that hand to my heart and hold it there. I take a deep breath simultaneously, until my diaphragm is full and my chest begins to puff up. My right hand is stretched up in the air vertically. Hold the breath for 3... 2... 1... and release. I sit with this feeling for a moment, recalling the pitch and holding the visual image of the tone-color triangle in my mind's eye. All of this audio/visual signal is being stored in the crystal pyramid, so that each time I return to the meditation, all of my previous meditations and lessons learned are available. Thanks for posting this! I get the impression that the tones are serving pretty much purely as an additional mnemonic device, each tone with specific correspondences. Is that right? Yes, Paul Case's book on the tarot certainly incorporated tone into the system as a mnemonic device, borrowed from Edward Maryon's MARCOTONE (tone-color) method. 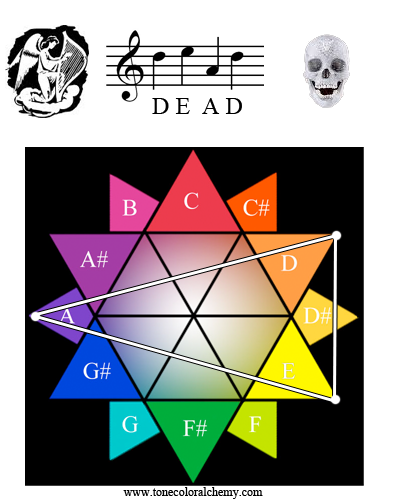 However, because my background is in songwriting and harmonic theory, I have chosen to invert the orientation, utilizing tarot, minerals, and color as mnemonic devices toward ear training and the development of super-relative pitch. We become better listeners. Each user's orientation would determine the focus of the study, I suppose. My goal is to draw esoteric thought back into music, as a means to overcome the divisive politics of MP3 culture and return to a more foundational understanding of musical geometry. The tone color project is the vehicle for this intent. good stuff man found you guys on a few videos on myspace pretty good stuff, but i see what your saying its all good. I'd be happy to chat about this project though, if you've got any questions. Why not pose the question in the public forum? Who knows, maybe other people have the same questions. Neutralrobotboy wrote: I've given it a look. It seems like a good idea. Well designed site and all that, and I can't imagine how much effort and/or expense would have gone into getting it all up and running, including DVDs... If you don't mind me asking, how successful would you say it's been? How long have the site + DVD been up in their current forms? Seems like it must be a fairly recent development. After a year of studying Marcotone and experimenting with it, I connected with Lance Smith from Blue Apples Metaphysical Wellness shop up here in British Columbia. He's the one who developed the website, created the binaural beats, and did the brief hypnotic inductions at beginning and end of the DVDs. Steve was going to do the videos but we soon discovered that he didn't have the expertise to do 3d video image generation, so we outsourced the video production to a friend in Australia. The money for that came out of pocket, in advance, and still more money is owed. In the mean time, we have created a product that we believe to be powerful and effective. As for the success of the business... I suppose it's relative. We launched a promo video through Steve's channel which has received about 5k+ views in the past three weeks. Of that number of viewers, 8 people have subscribed. That's about .001%! 3. The low number of members allows for a unique 1-on-1 relationship to form between myself and other members in the community. The relationship functions as in a classroom/tutor situation, where I bring my knowledge of music theory and arcane symbolism into other members' study of the tone-color circle. Often times, I learn things from them as well. This dynamic would be impossible if a large number of members signed up at once. We have considered the alternatives of lowering the price, or even biting the bullet and making the whole program free (Via torrents). I personally hope that freedom of information and instruction is written into the future of Tone Color Alchemy. However, the apparent lack of interest demonstrated at the outer forum suggests to me that we might actually do ourselves a disservice by opening up the floodgates too early. The website and DVD have been available in their current form for three weeks. Things are going well at the Tone Color Alchemy project. People are slowly trickling in from many different magical traditions to discuss the unified Western Musical Circuit Board. This article was posted at the Tone Color Alchemy BLOG this evening. 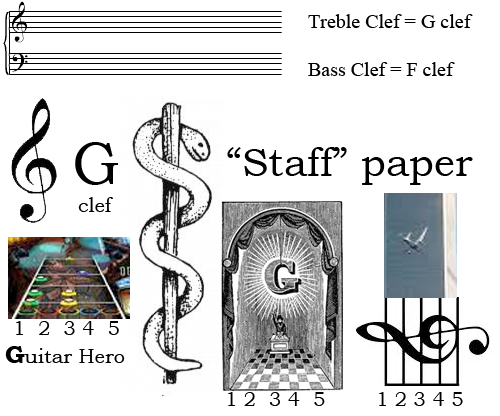 STAFF paper is the name of the common 5-lined musical grid. 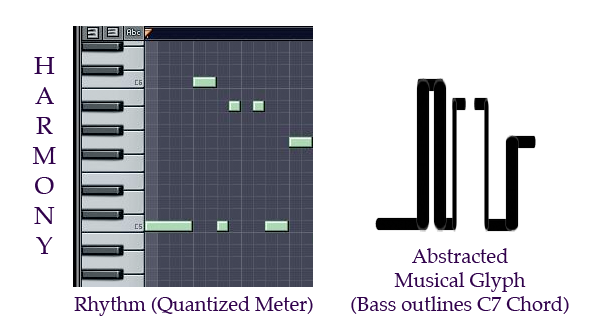 Different CLEFS can be assigned to the grid to imply different tonal centers. The treble clef is associated with G. The symbol for treble clef is an upright rod connected at its apex to a serpentine coil that falls down and curls around the second horizontal line from the bottom. That second horizontal line is assigned the note-value of G, because Treble clef is associated with G. Similarly, the Bass clef is associated with the note F. The upright rod curls around the second horizontal line from the top and that line is given the note value of F.
All clefs function in this way. Once the first note has been assigned to the staff, all of the other possible notes are implied. Continuing with our treble clef example, you can see that the space below the G-line is called F and the space above the G-Line is called A. Notes can only be written on or between the black lines. This implies a checkerboard dynamic of light and dark, as in the emblematic Freemasonic checkerboard squares. In the Key of C there are no accidentals (Sharps and Flats). At the top of this image I have presented you with a simple notation of the notes F A C E on treble clef, in the Key of C.
Below the treble staff is a colorful 12-pointed star. Each point of the star features one of the 12 tone colors, as described by Edward Maryon in his only published book, Marcotone. As you can see in this image, the tone-colors F A C E are connected by four lines, creating what appears to be an isosceles trapezoid. The intervals between these notes generates the white lines on the tone-color wheel. Notice that none of the lines cross over another. In this case, the crossover between notes, as demonstrated in the notation of the notes B E A D, has generated lines which intersect one another. BEADS are ornamental spheres that hang on a string. NOTES are ornamental spheres that hang on a staff. 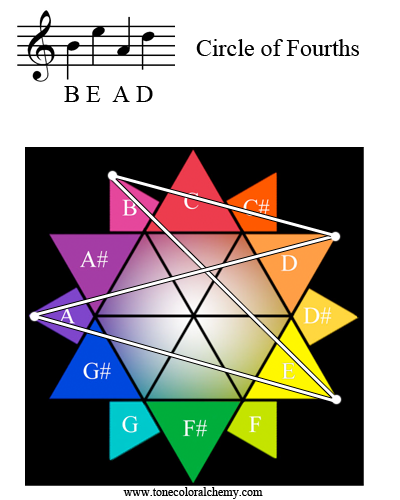 Geometrically, these notes connect to one another as lines, perceived during tone-color meditations as energetic threads, not dissimilar to beads on a threaded necklace. Everyone has heard the name of Wolfgang Amadeus Mozart and most have heard the music attributed to his name. However, few people are aware that a massive network of 18th century occult fraternities conspired to bring us this cherished Viennese idol. In this episode, we speak with revisionist historian and musicologist Robert Newman on the topic of Mozart’s life. Beginning with the orthodox view of events, Robert reminds us of the fine line between source documents retrieved from Mozart’s lifetime and the secondhand commentary of fraternal musicologists after Mozart’s death. A fascinating look at the early stages of music industry and the manipulation of public perception. Tone Color Alchemy reached 33 members this evening. I have long suspected that there was a relationship between the principles of Hermetic Alchemy and Western Tonal Harmony of Music. One of the first observations that ever registered in my mind was the potential for a discovery of the relationship between Solar/Lunar symbolism and the principles of Major/Minor key centers in Music Theory. A recent series of breakthrough discoveries have confirmed this suspicion. To understand this beautiful convergence of mysticism and music, we first need to review some conventional music theory. You have probably heard musicians talk about the Key of a song. In this context, the word key refers to the tonal center around which a passage of music is centered. A song's key may stay consistent for the duration of the piece or it may change multiple times. The easiest way to figure out the key of a song is to check the sheet music. Strictly speaking, there are only two kinds of Key Signatures: Major and Minor. Do not confuse the idea of musical keys with musical chords. A key relates to a phrase of music over time, whereas a chord is an assembly of notes that are played at the same time. Chords are played within a key signature. The primary function of a key is to define which notes are consistently sharp or flat during a phrase of music. There are twelve Major keys and Twelve Minor keys; One major and one minor key for each of the twelve notes in the subdivided octave. 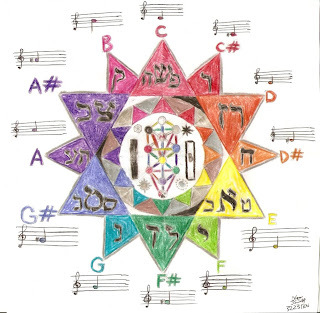 See the image at the top of this post for a colorful representation of the twelve notes. 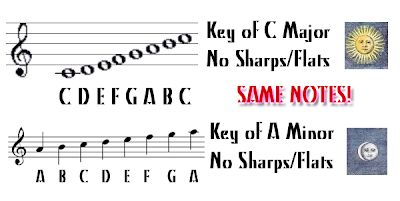 The key of C major is very simple, because it has no sharps and no flats. Therefore, if we begin at the root of the key, the C note, and climb upward through the scale of seven notes, there is no need to modify any of those notes in the process. 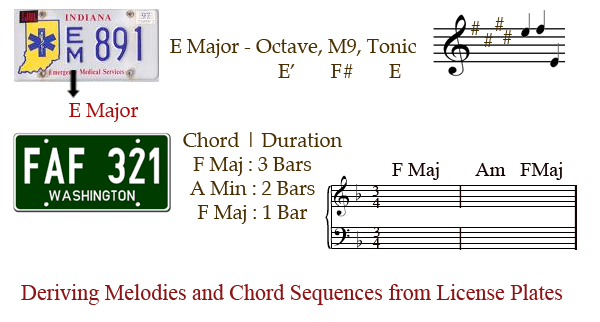 For this reason, C major is called the natural key. Every Major Key has a Relative Minor Key. This means that there is a minor key which contains the same number of sharps of flats as its Relative Major Key. Do you see how the words Relative Major and Minor lock into each other? 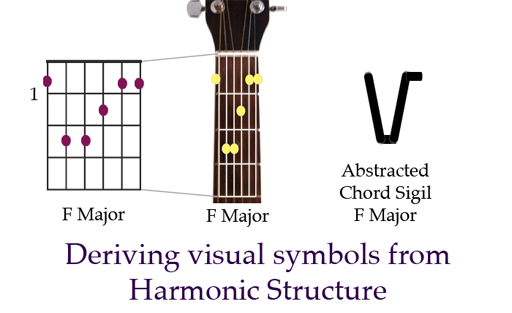 In the visual example above, you can see that C Major and A Minor are relative major and minor keys. They both contain no sharps or flats. They contain the same notes! The difference between Relative Major and Minor Keys is the tonal center. The word tonal simply refers to the concept of a musical tone. Therefore, the tonal center of a key defines the central tone upon which the listener's ear should gravitate toward when they hear the piece of music. Cycles of Day and Night are affected by Sun and Moon. The common denominator is our Planet. Depending on where our "tonal center" is on this planet, we receive varying degrees of exposure to the sun and the moon. 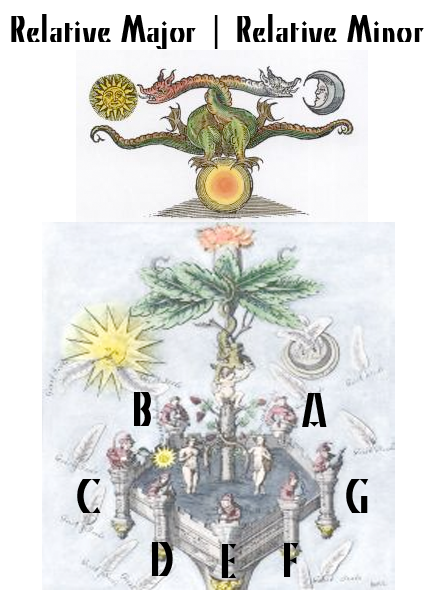 The alchemical emblem shown above was extracted from a section of the Ripley Scroll, colored by Adam McLean (http://www.alchemywebsite.com). I have superimposed the note-names of the C major and A minor scales onto the image for clarity during description. As you can see, there are only seven positions on this floating crucible. Each position is occupied by an Agent, which is actually an anthropomorphic representative of the frequency-node specified by that position in the musical scale. 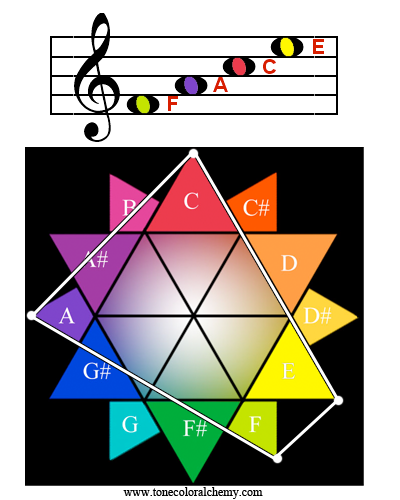 In other words, each note within the scale is simply a vibration (i.e. A=432 hz) which is held constant by the will of a fixed node of consciousness. This offers us a major clue to the way alchemical symbolism works. Images which seem bizarre only appear so because we have yet to understand the subtler energetic principle being represented. When we translate alchemical imagery into musical terms, these energetic principles are much easier to understand. We can see here that there is a direct correlation between Sun/Moon symbolism and Major/Minor key symbolism. In fact, it is common in occult literature that tarot cards are called tarot keys! In case you're not seeing the connection, the tarot key of The Sun is associated in the B.O.T.A. 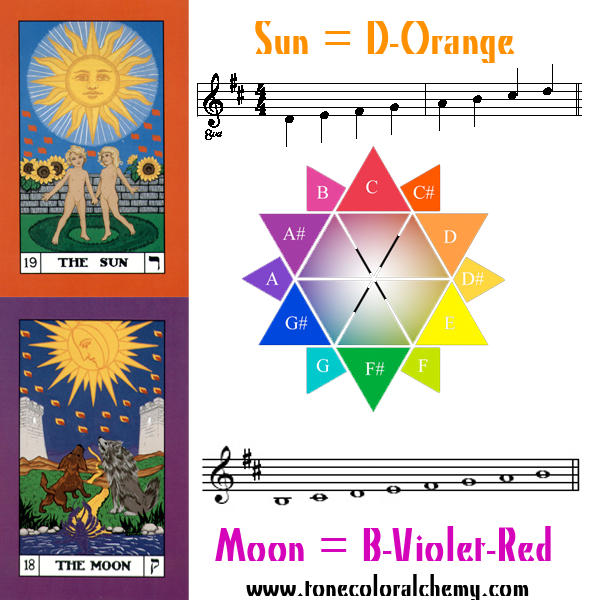 system with D-Orange and the moon card is associated with B-Violet Red. If we take the sun key to imply a major key and the moon key to imply a minor key, then we are looking at D-Major and B-Minor. This is a flawless fit with conventional music theory which places D major and B minor as relative major and minor keys, both containing two sharp notes. How beautiful is that! Synchromystic logic would allow us to take this otherwise textbook accuracy to a slightly higher plane of mystical awareness. Through a study of the Key centers of songs, we may begin to learn about the resonant feel that they are creating. 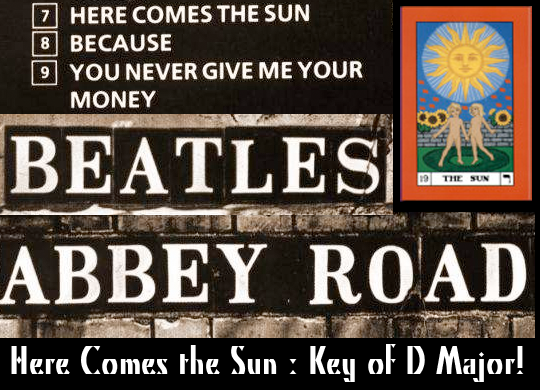 Every musician knows that the Beatles song "Here Comes the Sun" is in the key of D Major! Wow! Very impressive research And dedication. I will recommend your work to friends of mine interested in exactly this sort of thing. As a hardline chaote though, I absolutely must insist on using your alchemical glyph as a template for translating sigils into sounds and vice versa. For instance, taking my alphabet of desire and superimposing each sigil over your tonal map, reading counterclockwise where the points fall and creating a little tune intended for evocation. No good for one-shot spells I don't imagine, although maybe with some nonsense barbaric invocation used as lyrics...but possibly effective with my personal alphabet. It might also be a good way to turn my random songs into visual symbols...hmmm...Hope you're not offended that I'm hijacking your research tools for unintended uses! I'll let you know how the experiments turn out! Musical Thought Experiments challenge our traditional methods of coming up with harmonic and melodic patterns. As you can see in the examples above, I am still operating within a very traditional, tonal framework. We’re looking at different ways to disrespect and mistreat formal approaches to songwriting, while still honoring Tonal Harmony and 12 Tone Equal Temperament as our departure point. Binary system derived from physiological polarity (open hands). When working on body energy points and meditation on Tarot cards (and the Tree of Life) some four years ago, I dived deeply into the possibilities of resonating sounds with colors, that could be attached to such systems. As effective as I found my research, I came to the conclusion that sound frequency linked to color, wernt linked universally, but rather subjective to the personal inward subconscious resonates. I found color to be some what more universal in visualization (my personal research linking widely with others), though with sound, as there is many different scales, and music sytems, I found it was more personalized (I still found c to b normal scales worked best for me). Enjoyed your posts. I am bit late it seems.